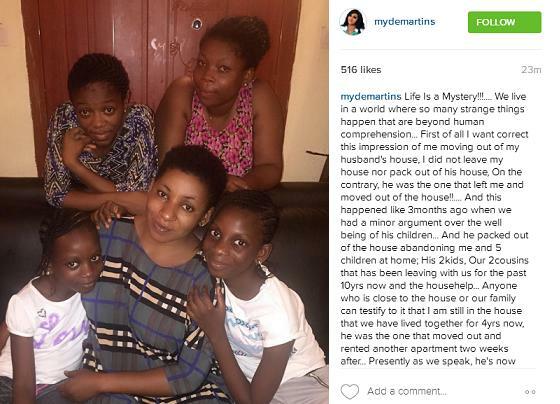 Mrs Omotayo Yemisi Akinwale got married in November 2012 then took-in and had 2 miscarriages. She was pregnant for the third time in August 2013,her husband later traveled to France in October 2013 since then she has been alone but at first everything seemed fine until after 9 months which extended to 1yr 4months; then her husband’s family stood up against her. She went for scan & the scan didn’t show baby but it showed there was something in her stomach, that was when trouble started in her husband’s family. A woman has set tongues wagging on social media after telling her incredible tale of boyfriends dying after dating her. She accompanied each photo with an explanation of what happend to them. "A week ago today, my sister-in-law's nephew, Utibeabasi Imohowo Sampson, was murdered by 7 children ages 14 to 16 at Pinnacle hotels, Edet Akpan Avenue Uyo, Akwa Ibom State.The murderers, including a girl, all dressed in black, had lured the 14-year-old boy to the hotel under the pretext of a get together, only for him to be left dead in the pool.The heartless murderers who are students of Monef Secondary School, Uyo, and children of influential people in the state, were about leaving the hotel without their victim when the gate man who noticed they were 8 when they came in, accosted them and asked them of the eighth person. Prince was found dying in an elevator at his $10million mansion this morning and could not be saved by paramedics who gave the music legend CPR in a vain attempt to keep him alive.The 57-year-old icon was found unresponsive in the elevator at his suburban estate in Minnesota at 9.43am EST today and was pronounced dead less than 30 minutes later.His cause of death is not known, but in a call to paramedics on the way to Prince's home, a 911 dispatcher said: 'Male down, not breathing. 'It has emerged that Prince made several trips to a Walgreen's pharmacy in the days before his death and is said to have appeared more 'frail and nervous' than usual on a visit to the store last night. President Barack Obama has led his countrymen in mourning the death of legendary pop star Prince, whom he described as the “most gifted and prolific” musician of his time. “Today, the world lost a creative icon,” Obama, who is currently on a three-nation six-day tour of Saudi Arabia, the UK and Germany, said in a statement on Thursday (April 21). Pop music superstar Prince Rogers Nelson popular as Prince was found dead at his home in suburban Minneapolis yesterday Thursday (April 21). He was 57. 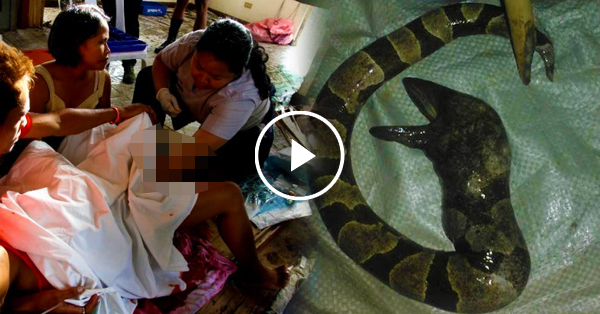 A woman from Giyani in Limpopo gave birth to a snake-like creature, Mzansi online reports. It was gathered that the weird incident took place in the Giyani town of South Africa. According to neighbours, the 37-­year-­old woman and her family are still puzzled with the mysterious thing that happened to her. The woman identified as Avhapfani said she started feeling sick sometime in October last year and would continuously vomit. Her husband, who works in Rustenburg encouraged her to take a pregnancy test of which it came back negative. Ripples Nigeria has learnt that what began as an innocuous award to Deputy Senate President,Ike Ekweremadu, on Tuesday has created serious unease in the camp of Dr Bukola Saraki, incumbent leader of the Senate, who is currently facing trial at the Code of Conduct Tribunal for false declaration of assets. The award, ‘Anti-corruption Ambassador,’ which is now mired in controversy was reportedly cooked for Mr Ekweremadu by the Liaison Officer of the Economic and Financial Crimes Commission (EFCC) at the National Assembly, Mr Sulaiman Bakari. The agency has since denied the said staff, leaving the Deputy Senate President thoroughly embarrassed and feeling that he may have been scammed. A self-confessed cultist, Muhideen Ibrahim, who was arrested by the Lagos State Police Command, has said he conveyed guns to the All Progressives Congress campaign venues during the 2015 electioneering on the Lagos Island. Ibrahim, 29, from Kwara State, added that he took two pump-action rifles to the governorship primaries held at the Tafawa Balewa Square in the Onikan area for the “protection of my gang’s candidate”. The Federal Government has amended the charges of false asset declaration preferred against the Senate President, Dr. Bukola Saraki, before the Code of Conduct Tribunal in Abuja. With the amendment, Saraki will be facing two fresh charges in addition to the 13 counts originally preferred against him, which comprised false asset declaration and maintaining of offshore account while serving as Governor of Kwara State between 2003 and 2011. Ooni of Ife's wife, Olori Adeyeye Wuraola Ogunwusi celebrated her birthday yesterday April 20th at her husband's palace in Enuwa Ile-Ife. Check out exclusive pictures of her birthday cake and more pics from her party. Ooni Of Ife, Alake of Egba, Others at the Opening ceremony for Nigeria Drum Festival 2016, flagged off by His Excellency, Sen. Ibikunle Amosun Ogun State. Opening ceremonies for Nigeria Drum Festival 2016, flagged off by His Excellency, Sen. Ibikunle Amosun CON FCA, in Abeokuta,Ogun State. INSIDE INNOSON MOTOR MANUFACTURING PLANT NNEWI NIGERIA - World's First Black-Owned Car Manufacturer - French TV Visits Innoson Automobile Manufacturing In Nnewi. 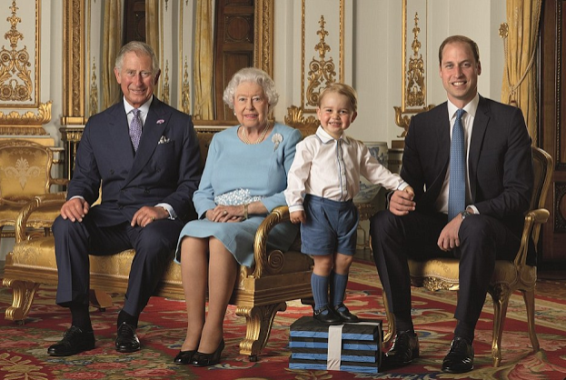 The youngest among six children, Chief (Dr) Innocent Ifediaso Chukwuma (OFR), was born into the family of Mr & Mrs Chukwuma Mojekwu of Uru-Umudim, Nnewi, in Anambra State, without the proverbial silver spoon in his mouth. But, what he lacked in affluent parental background, he made up for with intelligence, hard-work, discipline and business acumen - qualities that have continued to interplay remarkably in his many ventures. Ex Beauty Eueen, Nike Oshinowo, Speaks About Her Struggle With Endometriosis - "There are so many things I have never done without my period"
At the recent Gala Night of Fun and Fund Raising for Endometriosis put together by the Endometriosis Support Group of Nigeria, the 50-year-old mother-of-two said: “I have lived with endometriosis since the age of 13. I was sent to boarding school in England. It was during the first few days in secondary school that I began my (menstrual) periods. They called the ambulance and I was hospitalized for 10 days because the pain started and wouldn’t stop. I thought I was going to die, the first two days I was in the infirmary. I’m telling the story because it happened in England and, supposedly, the white people, who knew best, yet had no idea what was wrong with me. This seems to confirm the saying that 'what a man co do, a woman can do better'. 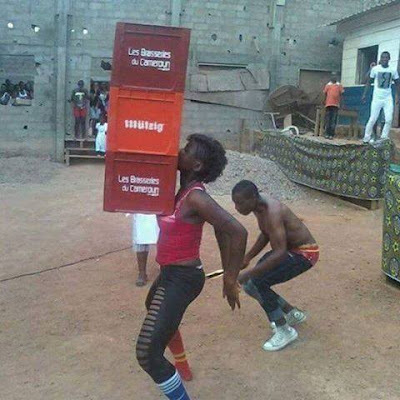 If a man can carry a bag of cement with his teeth, a woman can carry 3 crates of drinks with her own mouth aided by her bre*sts ("battle of supremacy"). This woman was spotted displaying her rare talent at an event. A woman suspected to have killed a two-week old baby of her former boyfriend by throwing it (the baby) into a public toilet has been arrested by Bole District Police Command, Ghana.The Bole District Police Commander, ASP Eric Awiadem, told Citi News the mother of the deceased baby, left him in the care of some children but could not locate him when she returned. "The complainant, who is the mother of the deceased, left the baby boy in the care of other children in her room. When she returned, the baby was nowhere to be found. A search was conducted and we found the baby in the pit of a public toilet," he said. An impeccable source at the Economic and Financial Crimes Commission told our correspondent that Amosu issued two bank drafts to the Federal Government as part of the funds allegedly diverted by his office as Chief of Air Staff. The PUNCHhad exclusively reported on February 11 that houses belonging to Amosu worth over N500m had been seized by the EFCC. It was shock and surprise in Borno state as the Deputy Governor discovered that workers at an Internally Displaced Persons Camp have been cooking soup for the people in the camp with weed grass. Many people have been left in shock after news that the Deputy Governor of Borno State, Alhaji Usman Mamman Durkwa allegedly caught workers cooking for the Internally Displaced Persons cooking soup with 'weed' grass. Two Day Old Baby Who Was Dumped In A Trash Can By Her Mother Rescued. This is why it's advisable for ladies to use protection -that's if one can't totally abstain ... to avoid this kind of horrific act. A two-day baby was thrown in a trash can by her mother and was found alive, under a pile of garbage recently in Cameroon. The baby girl which was immediately taken to a hospital in the region -is now healthy and already bouncing back to life. Caroline Danjuma Shades Linda Ikeji? Moments ago, Caroline Danjuma took to Instagram to shade an unnamed rival, someone she calls a bully. It is unclear who Danjuma is referring to, but many think she is referring to Linda Ikeji. Although she has now taken the post but we still wonder who she was referring to. According to sources,the deceased body was found at the back of a building few days after her boy friend dumped her.So far the deceased's name has not been confirmed..continue to see the uncensored picture. 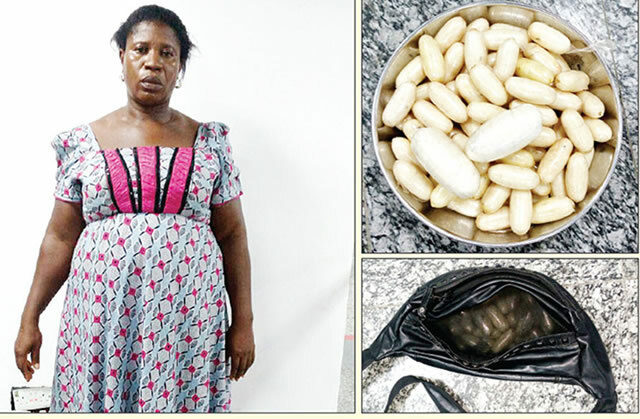 National Drug Law Enforcement Agency on Saturday apprehended a woman called Dorothy Onyekasi for allegedly faking pregnancy at the Murtala Mohammed International Airport Lagos, with 86 pellets of a white powdery substance that tested positive for cocaine tied to her belly. The cocaine weighed 1.720kg with an estimated street value of N20.6m, said the NDLEA . 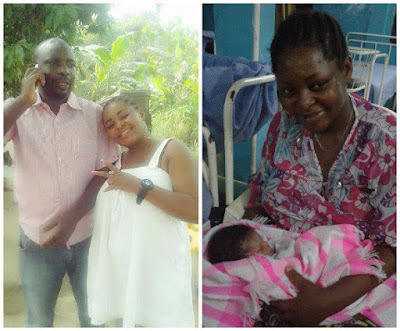 The said woman Onyekasi, 41 is a mother of three who hails from Enugu State. We Nigerians lead and other Africans follow, that's our place if not for the acts of few unscrupulous elements who are bent on rubbishing the image of our country abroad. Good we still have a lot of good men. History was made in the Royal Borough of Greenwich, South-East London after a Nigerian man became the first elected African mayor of the community. 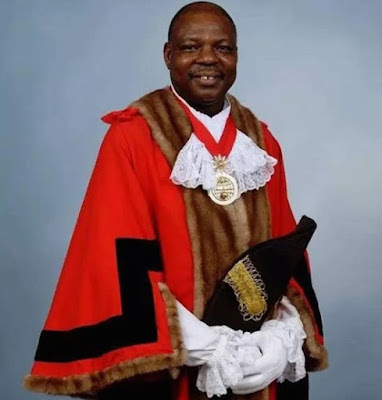 59-year-old Nigerian-born Mayor Olugbenga Babatola, who has lived in the UK for decades, had previously served as a councillor in the Greenwich district - a position to which he was elected in 2014 for his inspirational leadership style. 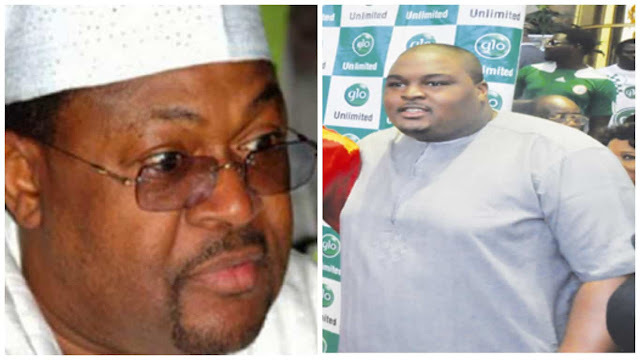 Eniola Adenuga, son of multi-billionaire businessman, Mike Adenuga has won the first round in his ongoing battle for custody of the daughter he fathered with ex-girlfriend Maggie Ogun. An Igbosere Magistrate’s Court in Lagos granted custody rights to Eniola, son of billionaire businessman, Mike Adenuga, over his 16-month old daughter. But his estranged girlfriend with whom he had the child, Maggie Ogun, a pharmacist, has sought the court’s leave to appeal the order. In his earlier ruling, Chief Magistrate O. A. Ogunbowale had dismissed her objection that Adenuga cannot take adequate care of the child. Ugandan professor, Dr. Stella Nyanzi, went naked earlier today, at her office. According to her post on Facebook, she decided to strip naked in protest after her boss locked her office at Makerere University. She claimed her boss was forcing her to teach at the university while she was only contracted to do research work and not teaching. Ana Paola Diniz, a dog breeder and businesswoman pet resort owner, paid £63,400 to have a passionate kiss with her idol. The kiss was first prize in an auction to raise money for AIDS charities taking place in Sao Paulo, Brazil, after Diniz put in the highest bid…. I’m nt a hater, bt only a kiss from Vic O is worth ds amount…. The Nigeria Labour Congress has called on senators who benefited from a recent purchase of 108 brand new Toyota Land Cruiser vehicles by the Senate to immediately return same or face the wrath of the Nigerian people. The union described the purchase, coming at a time the country is enduring excruciating financial crisis, as a crime against the people. Reports said senators have started taking delivery of the new Sports Utility Vehicles, SUVs, since last week at the rate of N35.1 million per unit. The secret distribution of the first batch of the brand new 108 Sport Utility Vehicles to 36 senators last Thursday has started generating tension and ill-feelings among members of the upper chamber. Investigations by Punch correspondent revealed that each senator from the 36 states had collected the keys to the Land Cruiser jeeps. A senator who craved anonymity, confided in our correspondent on Sunday, that only identified members of the pro-Saraki’s Like Minds Senators were favoured in the distribution of the vehicles. 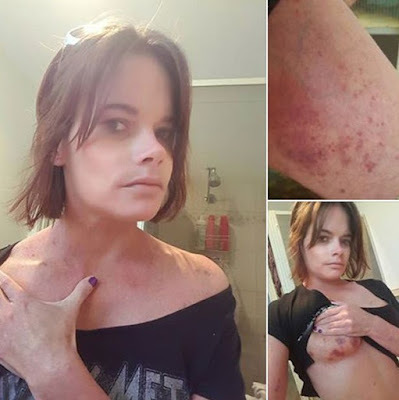 A woman has revealed the shocking and brutal injuries she got when a man she met on a dating site attacked her and raped her. NOTHING in life can be hidden forever. No matter how long you pretend as if all is well, be it in business or career, someday only with time, light will exhume those shady deeds you felt no one ever saw you perpetuate.Sheikh Khalifa bin Zayed bin Sultan Al-Nahyan is hereditary ruler of United Arab Emirates (U.A.E.) capital Abu Dhabi. Al-Nahyan is head of the country’s richest emirate and he is one of the world’s wealthiest monarchs. As confirmed by FORBES recently, his entire wealth is not all from oil, although he does control 97.8 billion barrels of proved reserves: he also runs the world’s second-largest sovereign wealth fund, with reported assets of $773 billion. Undercover investigation as documented inside the Mossack Fonseca data British Virgin Islands companies used to buy luxury real estate and other properties showed that Sheikh Khalifa was the original beneficial owner of at least 30 companies established in the British Virgin Islands by Mossack Fonseca, through which he held commercial and residential properties in pricey areas of London such as Kensington and Mayfair, worth at least $1.7 billion. Fausat and Rafiu Balogun: Only few people know that Fausat balogun popularly called madam Saje and her husband Rafiu Balogun are couple. The much-awaited 40 years on stage celebration of veteran Yoruba actress, Fausat Balogun popularly known as Madam Saje, will hold today, April 17, 2016. Billed to hold at Time Square Event Centre, Ajao Road, Ikeja, the event will see Fuji music star, Wasiu Alabi Pasuma, Olamide and Small Doctor perform. "Life Is a Mystery!!!.... We live in a world where so many strange things happen that are beyond human comprehension... First of all I want correct this impression of me moving out of my husband's house, I did not leave my house nor pack out of his house, On the contrary, he was the one that left me and moved out of the house!!.... And this happened like 3months ago when we had a minor argument over the well being of his children... And he packed out of the house abandoning me and 5 children at home; His 2kids, Our 2cousins that has been leaving with us for the past 10yrs now and the house help.